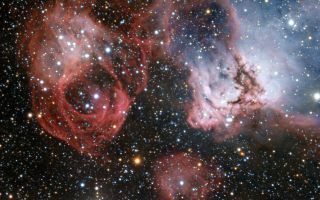 The Large Magellanic Cloud is one of the closest galaxies to our own. Astronomers have used ESO’s Very Large Telescope to explore NGC 2035, one of its lesser known regions, in great detail as seen in this stunning space wallpaper. Astronomers have used ESO’s Very Large Telescope to explore NGC 2035, one of its lesser known regions, in great detail as seen in this stunning space wallpaper. The Large Magellanic Cloud is one of the closest galaxies to our own. This image shows clouds of gas and dust where hot new stars are being born and are sculpting their surroundings into odd shapes. But the image also shows the effects of stellar death — filaments created by a supernova explosion (left).